I recently paid off the US dollar loan in my portfolio due to layered debt concern. This new year could see the end of the euro… or a euro crisis is the least we should expect. If so… investments in euro made with borrowed US dollars could suffer a serious loss. I do not have many investments in the euro. I invested my borrowed dollars in Australian, New Zealand dollars and Mexican pesos. Still I cleared the loan as I do not want borrowed dollars and a portfolio leveraged with them during extreme volatility. The tendency of the market in troubled times is to rush to US dollars… even though this makes no fundamental sense. The end of my leverage reduces my potential for profit but also reduces my risk of loss. I sold Australian dollars and pesos and paid off my US dollar loan. We can see a wave of investments in Swiss francs and gold which suggests that markets are nervous about currencies. This makes sense. Investors have every reason to be nervous. Two major currency catastrophes are imaginable in 2011. One already mentioned above is the disintegration of the euro due to the inability of the some of EC members to pay their debts. The unimaginable destruction of the euro is now imaginable. The second concern is for the US dollar. US dollar fundamentals are extremely weak. Long term, I believe the US dollar will fall. Against what will it fall is the question. Everyone knows that US Federal debt is untenable. Now the overhanging risk from multi layered American debt is becoming public knowledge. Budgets are strained at every level…. federal, state, city and county. This photo from the TV show ” 60 minutes” says it all. 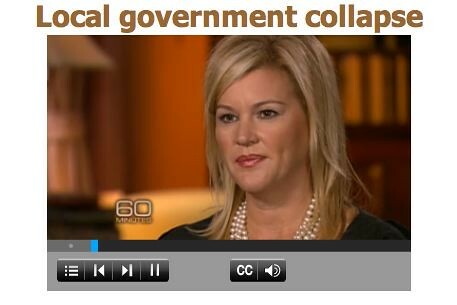 Photo from Cnet.com of a “60 Minutes” show about state and municipal debt. 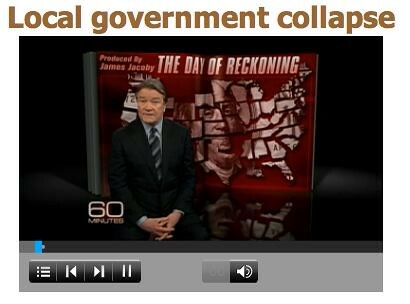 Our December 15, 2010 message looked at the problem of debt levels of many US States. This problem filters down into cities and counties as well. Default at these levels could strain the US dollar a lot. There is a link to this “60 Minutes” show that looks into this problem below. Don’t miss it if you have not seen it. Jyske Global Asset Managers feel as I do. Jyske sent these comments in their recent market update (bolds are mine): We enter 2011 with a moderate underweight position on bonds and a corresponding moderate overweight position on equities and/or commodities. Based on our expectations for 2011, we are likely to take on more equity and commodity exposure at the expense of bonds. We also enter the new year with an underweight position on the U.S. dollar and dollar denominated securities. likely to move into a more neutral dollar position if or when this opportunity arise. 2011 and we could be hit by corrections. the European Central Bank (ECB) to restrain. tensions and conflicts will persist. the euro and therefore, we foresee 2011 to be a problematic and stressful year for the European currency. there are restrictions or limits to this policy, especially in Europe. in Quantitative Easing (QE), printing money and buying bonds. inflation and unemployment and at present it is the high level of unemployment that worries the Fed the most. compared to Europe and this will continue until growth in the U.S. outpace Europe. period of tough fiscal thrift. Policymakers in the eurozone are handcuffed unless they let go of the euro. and hence, steepen the yield curve. We expect QE to come to an end in 2011.
curve shall not need to steepen. extend – the ECB is pumping out into the global economy. The positive growth picture especially in emerging markets, is generally good news for commodity markets. driver. However, the risk is that a bubble is building and a correction could happen sometime during 2011.
earnings yield predicts a better return. is already a growing fear in the market that bubbles are building in emerging markets. handcuffed governments and the ECB, forcing them to pursue (too) tight fiscal and monetary policies. commodities at the expense of bonds. pound back in 1992 and won. Like Jyske we feel that bonds are less likely to preserve wealth at this time. Like Jyske we are concerned about the potential for a stronger dollar… hence our removal of our dollar loan. #5: Our own Micro Business. Tomorrow’s message looks at one way we are expanding our investing and business in the environment. Do not miss tomorrow’s message “Scrubbing Business & Investments”.